Causeway Link, also known as Handal Indah or Handal Ceria, is the largest bus operator in Johor Bahru. Causeway Link began in 2003 with only 8 buses, with a cross-border bus service to Singapore. Gradually, Causeway Link expanded its cross-border bus services with several connecting routes and routes terminating in Singapore, as the only bus operator to cross the border with second link. Causeway Link buses are mostly operated in Johor Bahru. 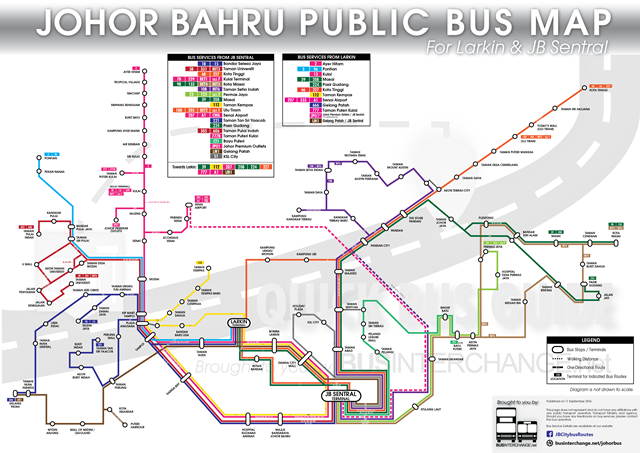 Its bus operations have been expanding in other cities such as Kuala Lumpur and Batu Pahat. Causeway Link also operates certain bus services with the branding of Bas Muafakat Johor, Trans Iskandar and Bas Iskandar Malaysia. Besides local bus services, Causeway Link also operates inter-city express bus services under its subsidiary, Causeway Link Express. "The Smiling Bus" - being their corporate slogan, are exhibited with the decoration of smiley faces on their buses. In the yellow corporate livery, the local bus fleet consists of many recently acquired buses, featuring the Electronic Display Signage (EDS). The purchases of new buses have seen the older buses phasing out gradually.